If you're like me, you likely get tired of making the same dishes time and time again, so when I was offered $40 off my first "Hello Fresh" subscription box, I decided to give it a try. Consumers have the option of ordering three meals for two or four, at $69 or $129 a box. Vegetarian options are priced $10 cheaper per box. My first shipment came packaged in a large box, with ice packs to keep the food cold in case the box needs to sit outside for awhile. Upon opening, I noticed the convenient rectangular container in which each meal was packaged, making them easy to stack in the refrigerator. 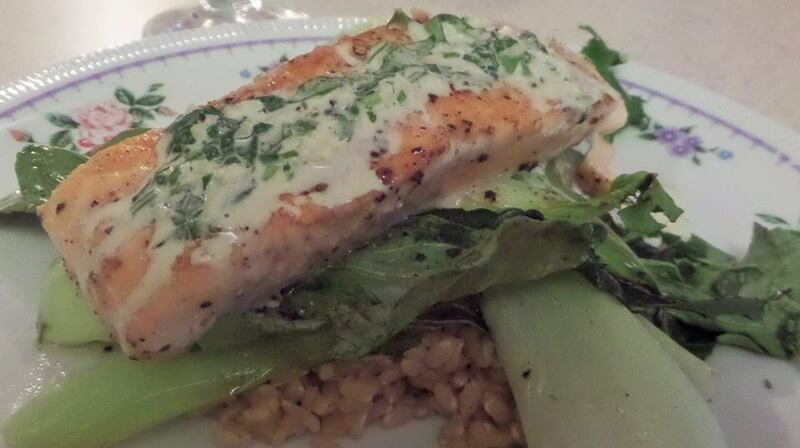 Crispy pan-seared salmon, with baby Bok Choy, cilantro wasabi dressing and soy-infused brown rice. Because I was busy when the shipment hit the porch, I tore through everything, glanced at the recipe cards, stacked the cartons in the refrigerator and went about my business for the next two days. Well, wouldn't you know it when I decided to make the first dish, I discovered I had misplaced the step-by-step directions. (They have yet to be found.) I was relieved to discover that the recipes can be downloaded from the "Hello Fresh" website, a feature I greatly appreciated. If you manage to keep handy the attractive glossy cards constructed of sturdy cardboard, they can be stored away for later use. Now onto dish number one. I give it a "Meh," with a capital "M."
Like all the dishes, the pan-seared garlic chicken required a lot of mincing, grating and chopping and it turns out the times were off. The roasted broccoli ended up underdone, along with the chicken. (Nothing worse than underdone chicken--a friend's husband served it to us once and she ended up divorcing him.) Slipping the dish in the microwave for 1.5 minutes did the trick, but still, it was a bit disappointing. Of all the meal components, the potatoes huancaina was the best. (If you can pronounce the drink Caipirinha, you can pronounce this; I can't, but I do love the drinks) Described in the marketing materials as a "Peruvian side dish consisting of silky Yukon potatoes smothered in a spicy cheese sauce," the dish was creamy and satisfying. Made with creme cheese, garlic and jalapeno, it is a dish I will likely make again to get out of the boring potato rut. Meat that arrived in the "Hello Fresh" shipment. The second dish also gets a "meh," (with a small "m") due to the onion ring execution (which is what that side deserved and it really wasn't my fault). Think "two all-beef patties, special sauce, lettuce, cheese, pickle, onions," well, you get my gist--except they changed things up a bit with a little twist of onions caramelized in Dijon. (I could have come up with that one on my own, or better yet, paid $4 and driven a mile down the road.) I will admit, however, I now have an inkling of what's in McDonald's "special sauce." Want a hint? Oh what the heck, I'll make it easy on you--hot paprika, mayo and minced onion (probably onion powder in McD's case). The side dish of onion rings ended up being a disaster. Following the directions, I sliced the rings, dipped them in the seasoned flour/water batter, then plunked them into the Panko. No matter how many times you turned those little rings around, nothing stuck to them--so they did rise to the level of being "healthier than fried," I suppose. Otherwise--a fail. The star of the show in this particular shipment was a crispy, pan-seared salmon. Cooking times were spot on and the cilantro/wasabi dressing was easy to make and enjoyable. It's a dish I'll return to time and again due to its deliciousness. Presentation is also a plus, making it an ideal choice for company. I can't say any of these dishes were necessarily low in the calorie department, unless we're talking about the, ahem--skinny rings. Calories for the chicken dish clock in at 582, which isn't bad. The salmon dish is listed at 652, with the burger meal topping out at 688 calories. Next up: I'll talk about the other three dishes I made with my second and final "Hello Fresh" shipment.